USS Bowfin is fortunate not to have ended up as scrap metal or as target practice and Bowfin is one of only fifteen U.S. WWII submarines that survived this fate. Today, USS Bowfin Submarine Museum & Park, is a reality; her story and the story of the U.S. Submarine Force, past and present, will be able to live on thanks to the hard work and dedication of individuals from both the military and the civilian communities. In early 1972, World War II submariner and Pearl Harbor survivor ADM Bernard A. “Chick” Clarey and RADM Paul L. Lacy approached the Secretary of the Navy about acquiring Bowfin as a memorial to the U.S. Submarine Force at Pearl Harbor. With the assistance of Hawai’i Senator Daniel Inouye, the acquisition was secured. Bowfin was towed to Pearl Harbor's Naval Inactive Ships Maintenance Facility from Seattle, WA. 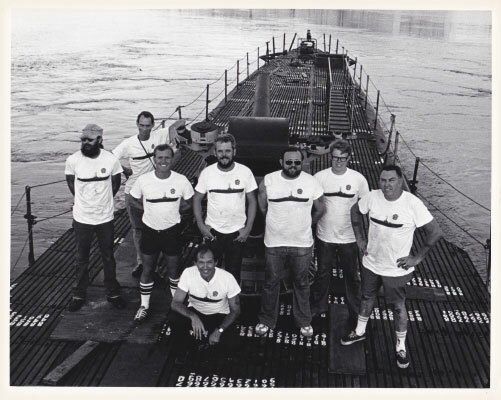 In 1978, a non-profit organization, the Pacific Fleet Submarine Memorial Association, PFSMA, was formed and chartered. On 3 August 1979, they formally acquired Bowfin from the U.S. Navy, made possible through an act of Congress passed on 10 August 1956. This act authorized the Secretary of the Navy to transfer by gift or otherwise, any obsolete vessel of the Navy to any U.S. non-profit organization who would promise to restore and preserve the vessel at no cost to the U.S. government and its taxpayers. One condition mandated that no part of the submarine may be activated for the purpose of navigation or movement of the submarine under her own power. Another condition stipulated that Bowfin must be maintained in a manner that would not be a discredit to the U.S. Navy or to the proud heritage of the submarine. 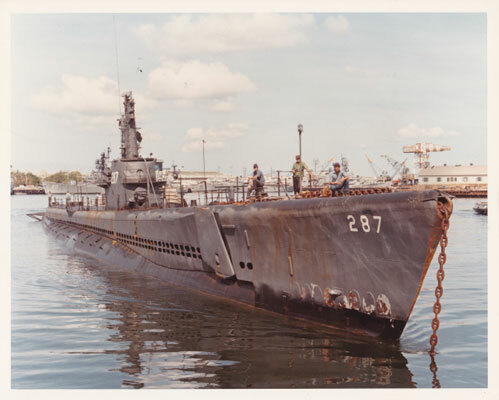 Later that month, the submarine was towed to Pier 39, near downtown Honolulu, where a group of volunteers from the civilian and military community alike, eagerly assisted in restoring Bowfin after years of neglect. The Dillingham Corporation did much of the preliminary restoration work as many Navy League members worked hard to secure the necessary funds to support the project. Meanwhile, PFSMA continued to search for a suitable permanent mooring site. 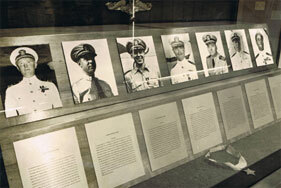 Left to right, Rev. 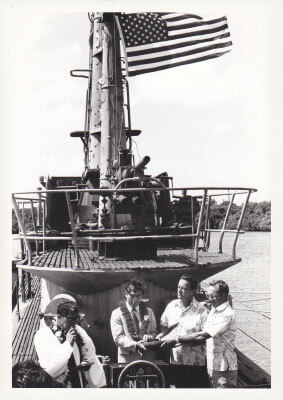 Abraham Akaka, unknown, Ted Damron, Harold Estes, at middle loch before moving Bowfin to pier 39. In December 1980, Bowfin was moved to her present day location at Pearl Harbor, adjacent to the World War II Valor in the Pacific National Monument. This is a fitting location for the submarine that had been launched a year after the attack on Pearl Harbor and nicknamed “The Pearl Harbor Avenger.” Bowfin became the centerpiece of the new area around her that became known as USS Bowfin Submarine Museum & Park. On 1 April 1981, Bowfin officially began her new career as a museum ship, and welcomed her first visitors on board. By 1985, over one million visitors had walked her decks, learning about what life was like for the submariners of WWII. In 1986, Bowfin was named a National Historic Landmark by the U.S. Department of the Interior. 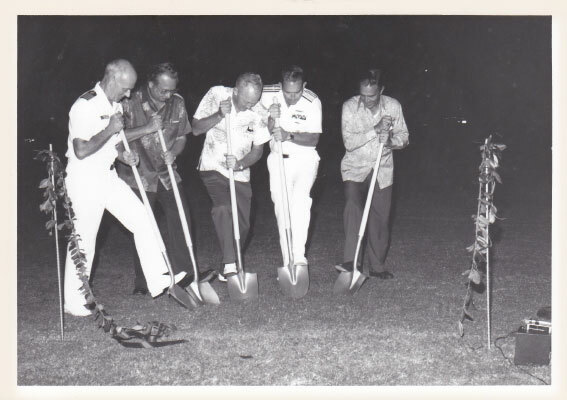 Ground breaking of USS Bowfin Submarine Museum & Park in 1986. Left to right, CAPT Paul O’Connor (CO Naval base), Bob Tanner, Harvey Gray, RADM Jack Darby (COMSUBPAC), Phil Bickel. In 1987, Bowfin was dry-docked in preparation for her role in the ABC Circle Films miniseries, War and Remembrance. She would portray three different submarines in the miniseries. Bowfin has also appeared in numerous television productions for PBS, The History Channel, and the National Geographic Channel, as well as three episodes of the ABC series Lost. She was dry-docked again in 2004 with major hull work, and returned to her current mooring. In 1989 the Pacific Submarine Museum that was located on Pearl Harbor’s Sub Base closed down and transferred the entire collection to USS Bowfin Submarine Museum & Park. 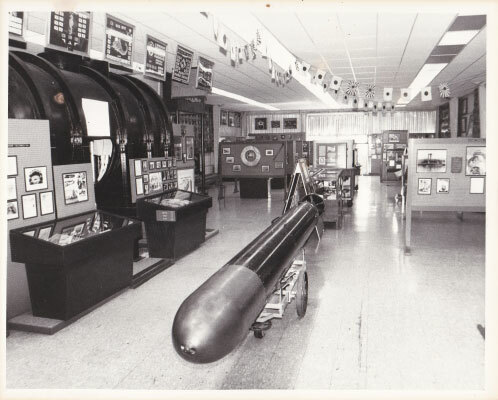 Today the museum houses thousands of artifacts, many from the Pacific Submarine Museum. Pacific Submarine Museum on Sub Base Pearl Harbor. 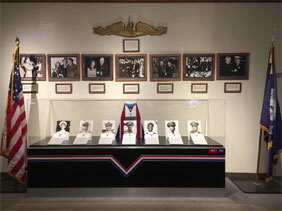 Current WWII section of museum. The history of the Pacific Submarine Museum and the USS Bowfin Submarine Museum & Park merger goes back to 1980 when USS Bowfin came to Pearl Harbor. 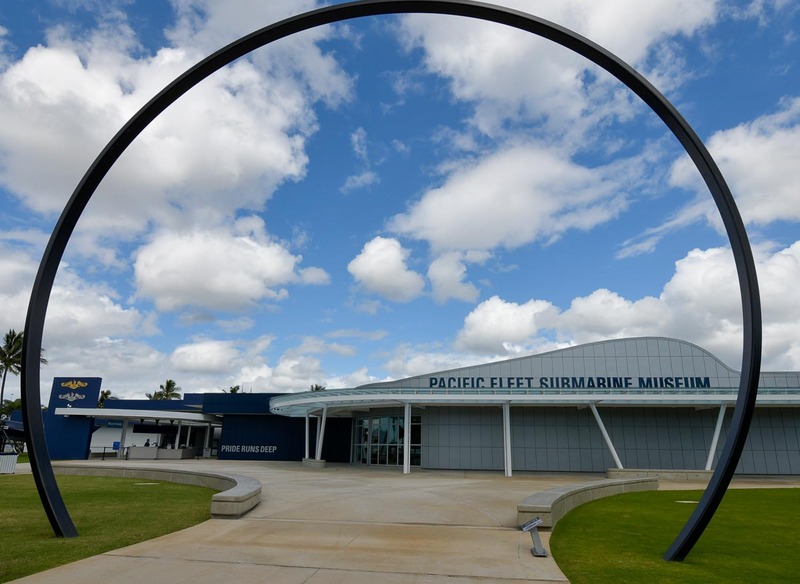 With continuing restrictions for visitors to gain access to Navy Base Pearl Harbor, it was evident that the museum on base needed to move to a more accessible location. When USS Bowfin arrived as a museum ship, it was a perfect fit. 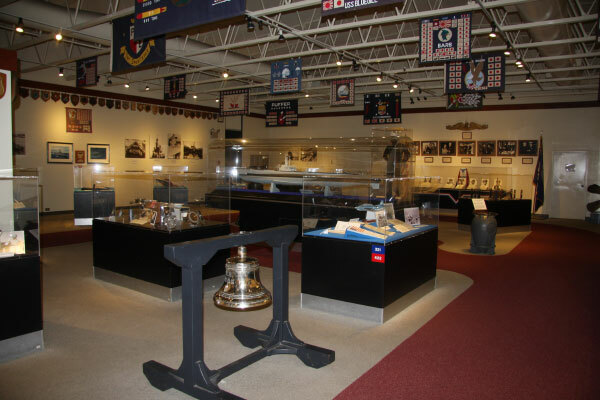 Here we have examples of the old exhibits along with our current exhibits that will soon be updated again with our museum expansion to take place in the near future. There were four submarines in port at Pearl Harbor at the time of the attack: USS Narwhal (SS-167), USS Dolphin (SS-169), USS Cachalot (SS-170), and USS Tautog (SS-199).